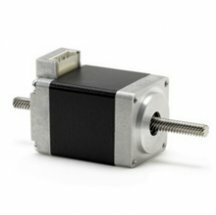 Based on modified hybrid stepping motors, ElectroCraft’s AxialPower Plus linear actuators are capable of producing linear forces up to 800 pounds and resolutions up to 0.000125" per 1.8° step. Available in NEMA frame sizes 11, 17, 23 & 34 these actuators provide torques to 395 oz-in or 280 Ncm. The reliability and precision of the AxialPower Plus and L3 linear actuators come from using only the highest quality parts such as stainless steel to increase the durability of the actuating leadscrews, and the internal rotating nuts are made from a range of engineered polymers which provide low-friction smooth operation. For applications needing a little more force, try the L3 linear actuators.